I've used your link. I deposited £1 but it's showing as £0. When will I see this ? Hey sorry for the late reply. It should have came up straight away. Did you do the invest option? Looks like this is all steadily giving people more pay outs and that's great news for just putting in £1. Do you want to get a free stock share worth up to £⁠100? Create a Trading 212 Invest account using this link www.trading212.com/ref/w94aI and we both get a free share! I've been a lurker here for a while and was apprehensive to say the least about this way to get a bit of cash. But I finally took the dive and I've deposited £1 (I didn't need verification, I guess not everyone gets verified) and now I have some free stock! I've withdrawn the cash and am waiting for it to show up on my bank account. I'll update when I've received my payment. My referral is below if you want to try this out as well. Create a Trading 212 Invest account using this link www.trading212.com/ref/4K8vv0O and we both get a free share! Want to Earn a free stock share worth up to ‎$100? This is a chance to earn some easy money, I’ve already made a profit, it sounds so spammy but it’s as close to free money as you can get. Otherwise you start with $0 and you wait for someone to use your own unique link. Search App Store or Playstore for "Trading212" if you don't want to use my link. Deposit £1 (make sure you slide all the way to the left to £1, you don't need to deposit anymore then this). You don’t need to do anything after that, just wait 24 hours and Trading 212 (fully regulated company - google them) will have given you a free share in a random company up to the value of £100. It’s their new referral promotion and you can make some decent cash out of it. Once you’ve been allocated your random share you can withdraw it by clicking on the up/down arrows at the bottom of the screen and click on the "x" to close the share at that price. All you need to do then is withdraw your money. To make more you can then share your unique code to get more sign ups, every time someone signs up with your code you get allocated another free random share. There’s no fees, no commission and no obligations, just sharing this to help people out (obviously I benefit too as I get a free share) don’t bother buying any stock unless you know what your doing , just get your free money. With the free promo they cannot take money from you. So just stick to your free auto allocated share rather than choosing your own stocks. Select "Trade with Real Money"
Choose the middle "Invest" account. Deposit £1 and within 24 working hours you will get a notification that your free share has been added to your account. This can be sold and withdrawn along with the £1 you initially deposited. You will only be able to withdraw it after 48 hours.sometimes 3 days, just a case of depositing a £1 watching it grow for a couple days and depositing. Before and Present of my account with referring friends and Family via my link as we both get free stocks via my referal link. Yes all sorted I Have my share now thanks. Did yu get an extra share for refering me? Speaking of withdrawals, just checked and mine has come through. Shows as Avus Capital. I've used your link, if anyone would like to use mine I'd be very grateful. Create a Trading 212 Invest account using this link www.trading212.com/ref/FMEtDAJd and we both get a free share! Create a Trading 212 Invest account using this link www.trading212.com/ref/FMJQou2b and we both get a free share! Gave me a £37 pound share, sweet! I'm still waiting for my share funds to be available for withdrawal. Any idea how long it typically takes for this to happen? Create a Trading 212 Invest account using this link www.trading212.com/ref/4K8vv0O and we both get a free share up to £100! Hey everyone! I just wanted to share one of the ways I have earned money so far. 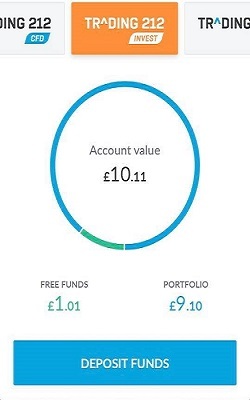 Sign up for £1 (using an investor account) and get a free random stock share worth up to £100. You can then sell and cash out straight away. 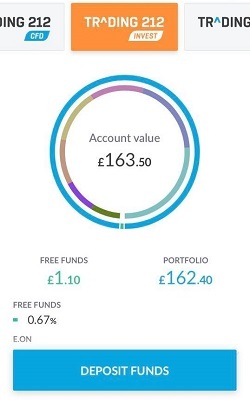 All you need to do is sign up using my referral link and select an invest account and deposit £1. This does not use the £1 and you can withdraw the £1 as well. Within 24 hours you will have a free share credited account. You can instantly sell this share and withdraw to card you have deposited with ( £1). For every friend you refer, you both get a share (of up to £100 value). Check this out it's pretty cool Here's my link: Do you want to get a free stock share worth up to £⁠100? Create a Trading 212 Invest account using this link www.trading212.com/ref/FMJQnWWv and we both get a free share! Remember to close your account once you have withdrew everything as you will be charged if your account is inactive after the 6 months period. I put in £1 a few hours ago and it's gone up already! I've just given this a go too, worth a try for £1! This is a fab way to make a few extra quid. I went through and deposited £1 in an invest account. Within 24 hours I had received my free share valued at £10.14. It was low but it was a free tenner. Bonus. I've now made a further £15 through referring a friend. Just waiting the 3 days to withdraw. Simply put £1 has turned into £25 . Create a Trading 212 Invest account using this link www.trading212.com/ref/4AsPns3 and we both get a free share! Create a Trading 212 Invest account using this link www.trading212.com/ref/3wm9YYx and we both get a free share! 1. Click on the above link and click open account, when selecting an account type click the INVEST account type, fill in the form with all you details. 2. Wait for your account to be activated, normally this happens automatically but sometimes you may need to undergo manual verification. When logged in just click CHAT and select Account Activation and follow the steps required. 3. When you have activated deposit £1 by clicking on your account in the top right hand corner and clicking deposit funds. Choose credit/debit card for instant deposit and no fees! 5. To withdraw the funds, click on your account in the top right corner of the screen, then choose the 'withdraw funds' option from the drop-down menu to withdraw your funds to your card/bank account. You can then close your Trading212 account if you don't need it by sending an email to info@trading212.com or by using the chat option. If you choose to keep it open that's fine, they is no inactivity fees. Do I've made about £45 now through referrals. Such an easy way to earn some pennies. on mobile the referral link just opens the app to download on play store - will i still qualify for the free share?